Dubai, UAE, June 13, 2016: A team of students from Canadian University Dubai (CUD) has secured AED 50,000 investment in their social enterprise, as the runners-up position in the inaugural Dubai Chamber Smartpreneur Competition. One of only two student groups in the entire competition, the team was initially shortlisted in the top 45 entries, and then selected among ten finalists to pitch their business idea to a high profile panel of judges. 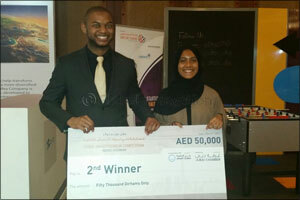 With their innovation ‘Efhamni ‘– a new mobile app to teach Emirati sign language – the students stood out among 350 original business ideas to be awarded second place in the prestigious enterprise competition, which attracted entries from novice and long-established entrepreneurs across the UAE. The technology was originally created as part of the region-wide ‘Ripples of Happiness' university challenge, in which the team won the runner-up place and a $7,000 award to scale the project. The idea behind Efhamni – Arabic for ‘understand me' – is to help unite the deaf and non-deaf communities of the UAE by teaching users the fundamentals of Emirati sign-language. It also seeks to support Emiratization among hearing impaired citizens, helping them to access better education and employment opportunities by teaching them, their family, friends and colleagues, how to communicate effectively. The app epitomized the objectives of the inaugural Dubai Chamber Smartpreneur Competition, which sought to bring forward technology-driven innovations that help to create a smart society, through the dimensions of economy, living, mobility, governance, environment, people and infrastructure. Speaking about their latest success, team member Craig Muyambo said, “It was amazing to be shortlisted in this competition among so many outstanding business ideas. Winning an award will give us further motivation to continue with the development of Efhamni and to make a difference to the hearing-impaired community.